A horse has fallen through the ice! 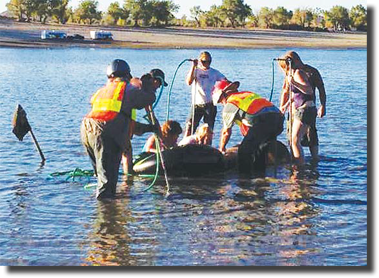 A draft horse is drowning in Lake Lahontan! 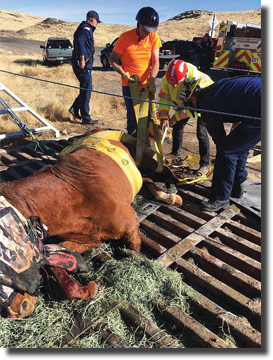 A wild horse is ca ught in a cattle guard! A trailer full of pregnant cows has gone over the embankment! Who you gonna call? 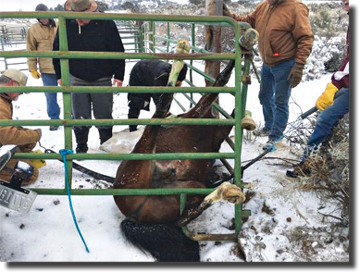 In Northwestern Nevada it will most likely be the team of trained technical large animal rescue volunteers based in Lyon and Douglas Counties who jokingly refer to themselves as the "Medicare mob." 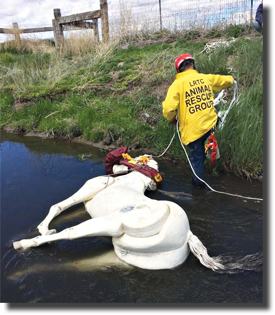 The team, hosted by Stagecoachbased Least Resistance Training Concepts, responded to over 200 calls for service in 2017, potentially making them the busiest technical large animal rescue team in the country. This call volume has been primarily driven by the presence of the Virginia Range horses and frequent conflicts between the freerange animals and everencroaching civilization. However domestic livestock can get in trouble too. The volunteers also get sent out to extricate large animals from floods and for assignments evacuating animals from wildfires where they are typically organized into formal mission compliments called "Strike Teams." 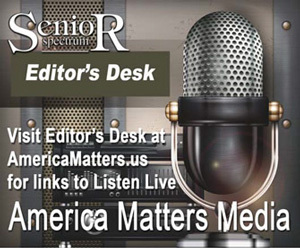 Not every member of the team is dodging the specter of elder care, but most are retirees. A few are in their 70s. 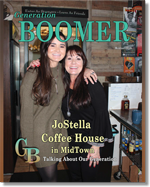 Most consider themselves to be "old school," coming from an era where the standard was to give back what they could to their communities. They have compassion for animals, understand that their presence can help prevent untrained citizens from getting injured, and relish the challenges of "in your face" problem solving. Some are retired from public safety and in their own words, "We’re still adrenaline junkies." Technical Large Animal Rescue is regarded as a highrisk response activity. Public safety agencies often defer to the volunteers to respond as specialists to resolve incidents that present dangerous potential if not handled correctly. 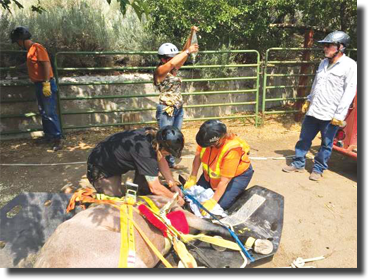 The volunteers engage in a great deal of training in order to accurately sizeup risks and develop the safest possible strategies to resolve these technical rescues, often using a fullsize horse training mannequin provided by Nevada’s Helen Close Foundation. The mannequin, dubbed "Winston" as he was built in England, allows the volunteers to practice and not get hurt if they make mistakes during the learning process. 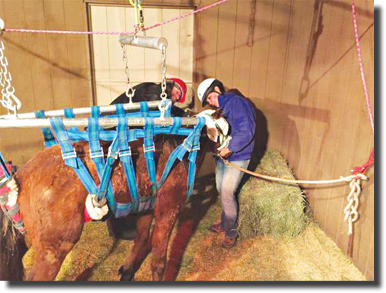 In years past the state provided training for technical large animal rescue responders. Given that this group of seniors not only may be the most active in the country, but have been asked to help write the 2018 edition of the Technical Large Animal Emergency Rescue manual, the state has turned the mission of training for first responders and volunteers over to the group. The team members train a great deal. They undertake FEMA large animal training, disaster training, incident command training, basic life support training, highway safety training and of course lots of handson practice using rope rescue gear, extricating and "packaging" large animals, proper use of extrication tools and related tasks. Wayne Woolway is an outdoorsloving retired Los Angeles police lieutenant who "escaped" to the peace and open spaces of Douglas County. In December the volunteers were faced with multiple overlapping calls including two ice rescues that in total lasted 81 hours, requiring volunteers to take roundtheclock shifts in freezing weather, organizing logistic support, and the undertaking of significant incident planning. Woolway was one of those responders and observed, "The training we get is good, but the learning experiences from working these calls is what really gets us on our game." It is advantageous that Woolway and some of the other volunteers are equestrians as occasionally incidents occur in remote areas that require access via horseback. Willis Lamm is the Commander of the group. Lamm retired from the fire service where his duties included being Captain of a fire station that housed the region’s Technical Rescue Truck and was his district’s Large Animal Rescue Program Lead. As a selfdescribed "Medicare card holder," he sees no problem with boomers and seniors taking on challenges that the general public would expect 30yearolds to be handling. "These responders are all volunteers, so naturally most are going to be retirees. Having older personnel undertaking physically challenging tasks requires the team captains to understand the capabilities and limitations of their individual crew members and make incident assignments accordingly. Our standard operations also call for one member to serve as Safety Officer, whose sole responsibility is to ensure safe tactical operations are being employed and that everyone is working within his or her capabilities." The volunteers agree that one advantage of having "more mature" personnel at incidents is the benefit derived from their greater respect for safety. While most operations have a formal Safety Officer assigned, everyone working the incident is in a sense a Safety Officer where the team members all look after each other. Lamm also observed, "In general the volunteers have a strong sense of purpose. Having specialized skills and the equipment needed to execute them safely allows them to fill a niche that otherwise would be left to chance; avoiding the need for public safety personnel to address situations that they aren’t fully trained and equipped to handle safely, and in doing so also make things safer for citizens and animals. They may mostly be seniors and they may be volunteers, but in the field they are professional rescue specialists." The host group, Least Resistance Training Concepts is an allvolunteer IRS 501(c)(3) nonprofit organization. Expenses for training and field operations are funded by donations. To learn more about this organization and its activities, please visit www.whmentors.org/evac .